Juan Otero serves as Vice President of Diversity and Inclusion for Comcast Corporation where he oversees the operational management of the company’s diversity and inclusion efforts across the corporate enterprise. Previously, Juan served as Vice President for Comcast Corporation’ Federal Government Affairs team. In this role, he was responsible for federal legislative advocacy with Members of Congress and the Administration. He was also responsible for developing strategies for achieving corporate legislative objectives and actively works with third-party policy stakeholders. 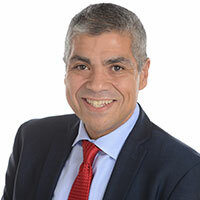 Prior to joining Comcast, Juan served as a director for the National Governors Association in Washington, D.C. and previously served as Deputy Director at the U.S. Department of Homeland Security (DHS), where he oversaw the Department’s efforts to develop improved interoperability technologies and communications. Before joining DHS, he worked as Principal Counsel for the National League of Cities.